Autumn in the Northland brings about the warm scents of pumpkin and cinnamon; leaves are now crunching beneath your feet; and excitement is in the air among seasonal deer hunters, anxiously awaiting the season opener. These signs, too, mean deer are on the move. October through early January is deer breeding season during which the animals are active and on the move. The additional activity causes greater threats to motor vehicles as we navigate dark, slippery roads. Drive aware. Scan nearby wooded areas, watch the side of the road. You should be able to spot glowing eyes in dark areas. Use high beam headlights when there is no oncoming traffic to illuminate larger areas. The sooner you see a deer, the more time you will have to react. Do not assume one standing deer is not a threat. Animals move suddenly and unexpectedly, and can quickly jump in front of your moving vehicle. Often times, deer do not travel alone. Assume there is more than one nearby. 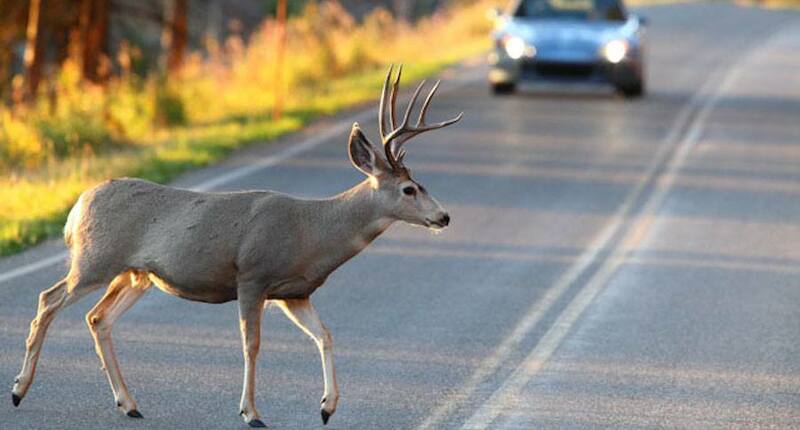 Flash your lights and honk your horn if you do see a deer close to the road. Perhaps the number one rule of thumb for deer -or other animal- collisions is to avoid swerving. In the event of an unavoidable collision, hitting an animal with your vehicle is less risk to your safety and the safety of others. Swerving in attempt to avoid the animal can cause collisions with other vehicles, running your car off the road or into oncoming traffic. If you ever find yourself in a collision with a deer, give us a call as soon as possible. The staff at Hanlon and Associates are here to help navigate your claims process and get you back on the road.